You can hear them from a mile off. A consistent and deep timbre, rhythmic, slow and, above all, loud. The fan groups at the Hahnenkamm Races have turned out in force again this year. We took a closer look at two of them and how they experienced the Hahnenkamm Races. The first ones we met up with were the “Perlen” Cowbell Group. The name gives a clue as to where the 26 people come from, Perlen, a small village not far from Lucerne, in Central Switzerland. They caught the train to Kitzbühel on Friday for the Hahnenkamm Weekend. Their luggage is full of cow bells, which they use to fire up the inimitable atmosphere before, during and after the races. They were photographed and filmed by countless fans on their way to the race course. Another Swiss fan group from Würenlingen, a group of musicians going by the name Teemöckerguuger, also came to see the Hahnenkamm Races. 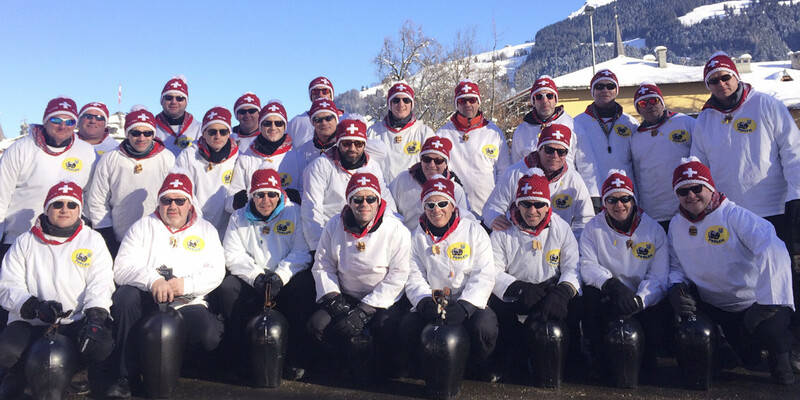 A grand total of 74 members embarked on the journey to Kitzbühel on Friday, full of anticipation for the Race Weekend. “We’ve got goosebumps. Just look at the beautiful weather and the amazing atmosphere”, the Würenlingen Teemöckerguuger exclaimed at Saturday’s Downhill. A meeting with skiing great Didier Cuche was a particular highlight. The Swiss fan group contacted him via facebook, asking for a meet and greet. Didier Cuche replied to the Würenlingen Teemöckerguuger and they now have another fan.